Are you a person who loves to bounce all over the Las Vegas sand banks? If you answered yes, then you have made the right decision with Dune Buggy rides. Dune buggies are vehicles designed to travel through deserts and beaches. With huge wheels, wide tires, and open chassis, dune buggies have the ability to ride on off road tasks and sand rails. You can drive a Dune Buggy vehicle over dunes with unbelievable speed. This dune buggy ride is unbelievable. Go faster than you ever thought possible in 15,000 acres of sand banks; this is a place without speed limits. Are you interesting in this wonderful experience with the participation of your friends and family? Just travel 15miles (24 kilo meters) from North East Las Vegas. A short journey and you reach Nellis Dunes (sand banks); it is the perfect place to take this ride. Driving the dune buggy is as simple as driving your own car; you can enjoy this ride with your entire family and friends. There is a 4-seater and even a 6-seater. Just put your seat belt on and your fully covered helmet, and start your journey. 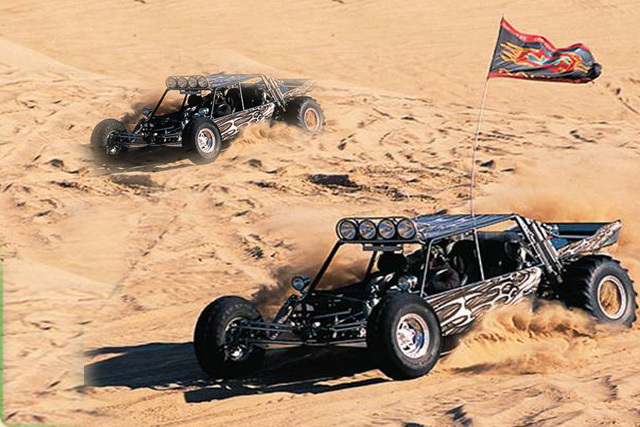 There are different types of rides; such as the Valley of Fire tour, Mini Baja chase, and the Dune buggy tour. Valley of Fire: In this ride you find red sand and beautiful rock formations. 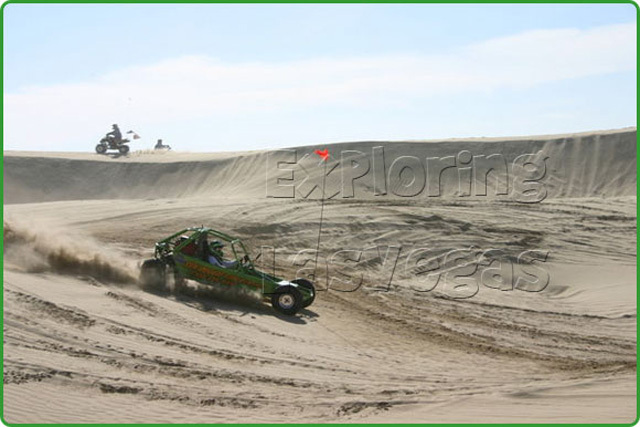 Mini Baja chase: It is an adventurous ride where you can chase your family members and friends in the vast 15,000 acres of sand. This is the only place for the speed lovers, because this place has no speed limit. Dune buggy tour: This is the place where you can feel free from tensions and sorrows, because you can roam here freely, no one questions anything. At the end of your Dune Buggy ride you will realize what a spectacular trip it was with your family and friends. It's an awesome experience that you will even see in the face of your family and friends. Gambling in the casinos doesn't even compare to the dune buggy rides. If you don't have a car to reach this place, don't worry there is a transport facility that runs every hour from 7.am to 6.pm every day. Before taking this adventurous dune buggy ride you need to take certain safety precautions. You need to protect yourself by wearing helmets & seat belts at all times, and you should have eye protection to protect your eyes from the dust and sand. Pregnant women are not allowed to take certain rides and you need to be at least 18 years old with an approved driving license to operate the dune buggy. There are certain rules for passengers as well. Passengers need to be at least 4 years old. Other than that, be ready to enjoy this remarkable ride! I've been on tour with these guys and what these vehicles can go through will blow your mind!!! Way more intense than riding a 4 wheeler dune-buggy, this is a real deal desert racer that'll tackle more than just sand dunes. The Trails were my favorite part of the chase. My experience with Sun buggy was just what I was told fast, wild, hair razing and crazy, my guides for my bachelor party are awesome they new there terrain and even accommodated all 27 of us,if your in Vegas for a bachelor party I highly recommend these guy's Thanks sun buggy fun rentals you guy's Rock...:o) 2 thumbs up .